I can't believe it. By the time this post goes viral live this Friday, I will have already had my last day with students. That happens on Thursday. Wow, this year went by so fast! 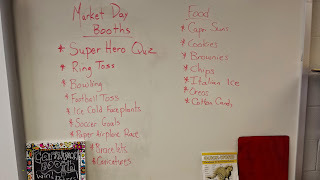 One of the things I like doing with my students to end the year with a bang is have a Market Day. For our Fourth Grade curriculum we study economics and how the earlier inhabitants of this great nation used it to their benefits. What better way to help educate the future money minds of America than by immersing them in the practice? I 'pay' my students with $10 fake money for each day they come to school and then an additional $10 for each day they properly perform their class jobs (line leader, pencil sharpener, clean up crew, etc). Then I withdraw 'taxes' from them to pay for the lights, water, and salary of the classroom. They groan about that, but it does help them understand why adults have to pay taxes. We start the year off deciding what items they would like to use their money for each week. 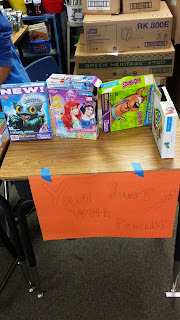 We then post the class store list of items which they can buy every Friday morning. The selections range from Shoes Off, to Sitting at the Teacher's Desk, to Lunch with the Principal. The prices range depending on interest and difficulty of setting it up. As the year closes, many still have some funds in their bankbooks to use for our Market Day. I start about two weeks out sending parents a notification about what is coming. 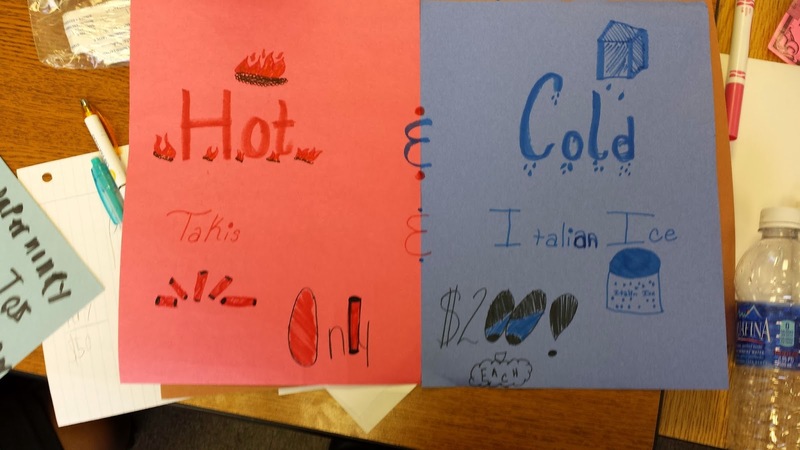 The students all start thinking about what Goods or Services they'd like to provide for their classmates. They can sell things such as lemonade, cookies, old toys, paper airplanes, rubber band jewelry, and tattoos. Or they can provide a service such as a nail salon, desk cleaning, neck massage, or hair styling. I have them pair up so that during our Market Day hour one of them can be out shopping while the other is behind the booth selling things. Then they switch in half an hour. They create advertisements for their stores drawing in the crowds and decide on a price they think their customers will pay. Sometimes if there are two booths selling the same items, I have to step in and regulate the price like government. Oy. Each store has a cash bag to collect their money in behind their desks. I give each student a page of 'checks' to cut out and use for the day. I try to give each of them only ten checks but they can request more from me so I can determine if they are approaching their money amounts. Wouldn't want them to be overdrawn now would we? At the end of the day they tally up how much they have made and split the profits with their teammate. Then I collect all the checks and separate them out by name to tally up how much they've spent and remove that from their bank books. Bank Books: click here to get a two page file to print out back to back and create your own! Check Sheet: click here to get a sheet to print for your own. This year I am doing something a little different, I decided to go with a State Fair theme and asked the students to think of carnival type food and booths they could create. We needed to brainstorm ideas for the booths since they weren't really getting the idea. Here's a shot of my board after we finished. The Big Day arrived on Wednesday. We usually have a short week on our last week of school so I like doing it the last Friday of the year, but I was working with another teacher and we had to come up with a plan. So Wednesday it is. 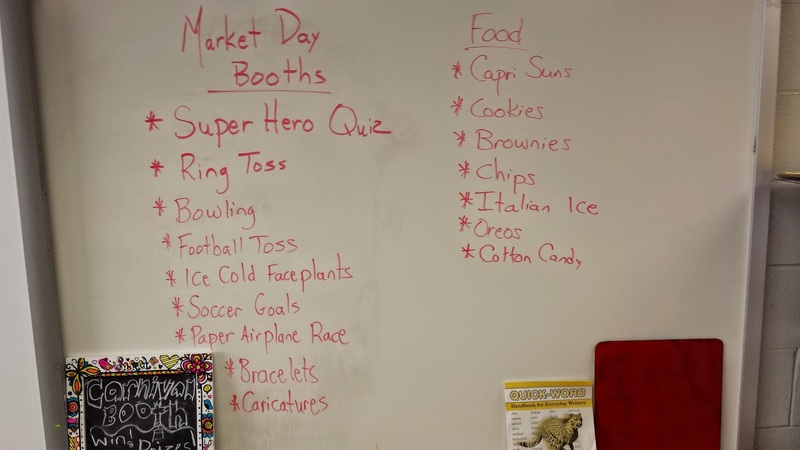 My students were really excited and even though I had posted a schedule of the day on the board they kept asking when we would be doing Market Day. The lead up to it was a whirlwind of getting desks arranged, putting the items out, getting bags ready, helping kids tie down goals, and figuring out where everyone needed to have their booths set up. We ended up with a great turn out and had to put three of the more interactive games out in the hall. Bowling, soccer goals, and Toss the Football were out there. Inside we had some food booths (great brownies! 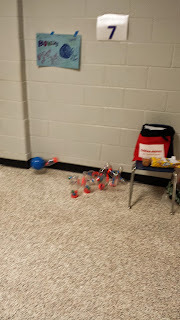 ), Super Hero Quiz (I totally rocked that one), and Ring Toss. But the most popular booth of the day was the Ice Bucket Challenge. 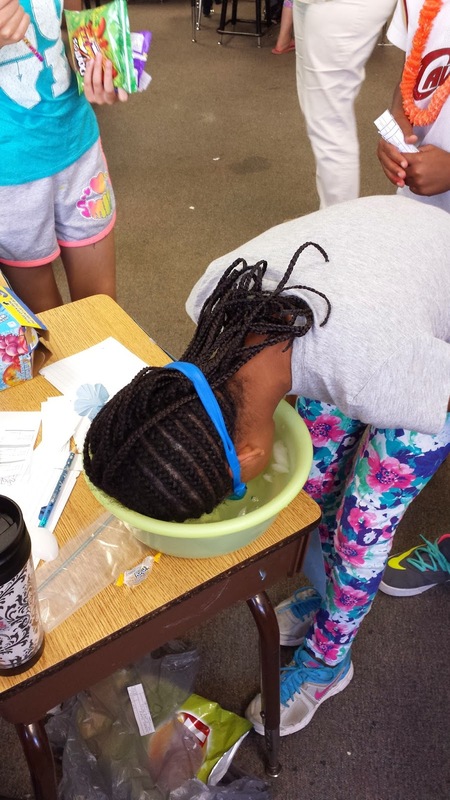 There was a bowl of water with ice cubes in it and you had to dunk your face inside to see how long you could keep your head down. He even provided some goggles for you to wear. There were various prizes for the length of time you accomplished. Overall I think they had fun and learned something about earning money and being careful when they spend. At least that's what I told the principal we were doing. If you have any questions about how all this works, feel free to leave me a comment and I will get back to you...now that I'M ON VACATION!!!!!!! There's a behavior incentive program on the market called Money Sense that's very similar to your own idea! Whole grade levels use it at my school and love it! Google it-I'm not sure what else is involved, but I know there's training. Kids have to pay rent on their desk and chair, taxes like you have set up, store license fees, etc. It's awesome! Thanks for the tip, SBT!